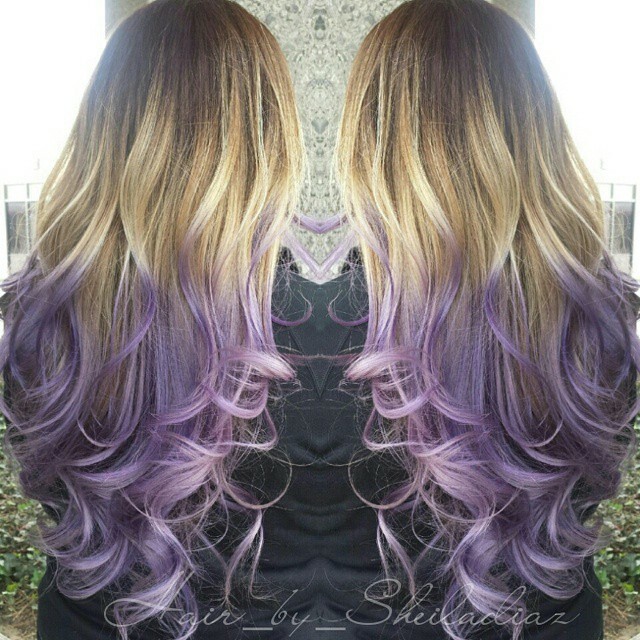 Today’s inspiration gallery is full of new hair color ideas for contemporary ombré designs. 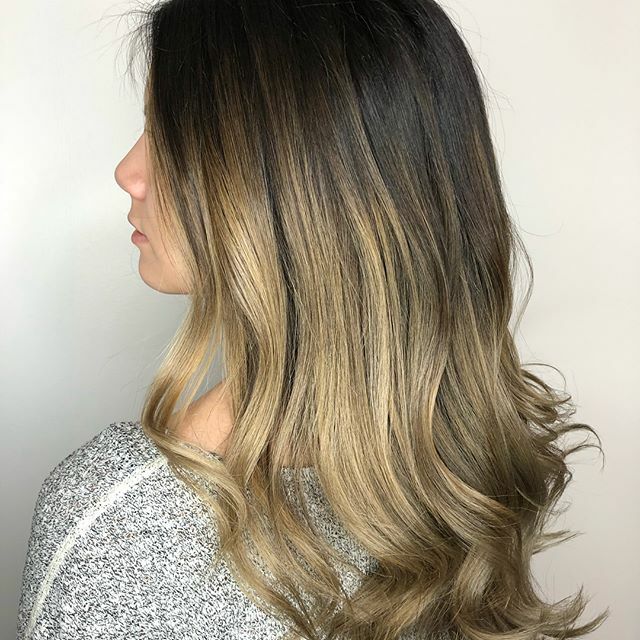 Golden-blonde and golden-brown offer a forgiving and flattering alternative to the neutral-blonde, ash-blonde and ash-brown shades that are impatiently waiting to take center stage. 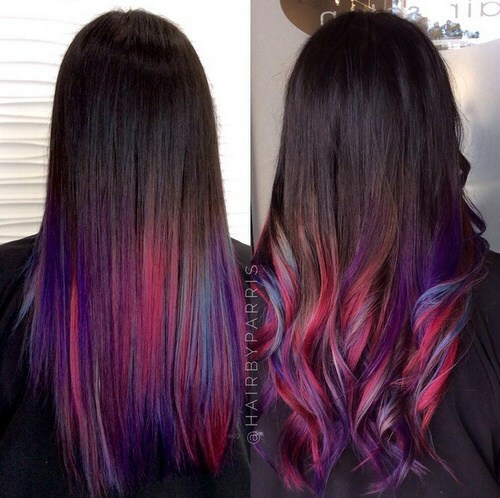 And I’ve included some spectacular rainbow color ombré inspiration, with new combinations like purple on black, fab sunset-colors, multi-toned ‘unicorn’ looks and all sorts of exciting color trends! 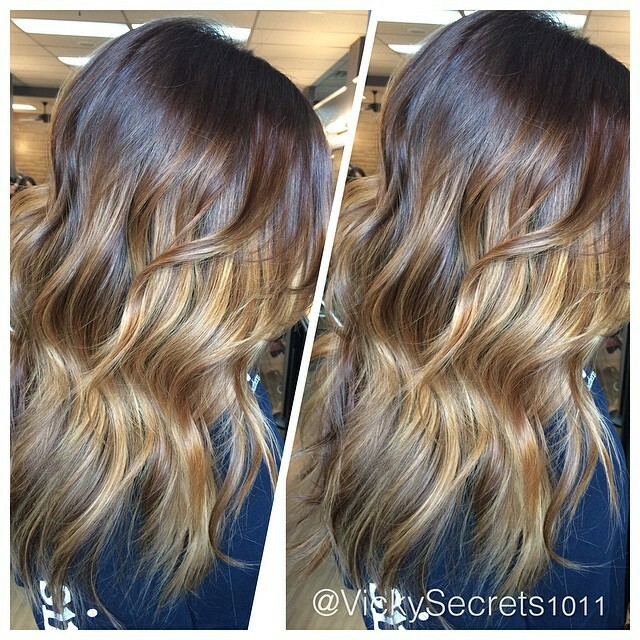 This season’s new ombré ideas are playing with the idea of light and shade with some really beautiful results. 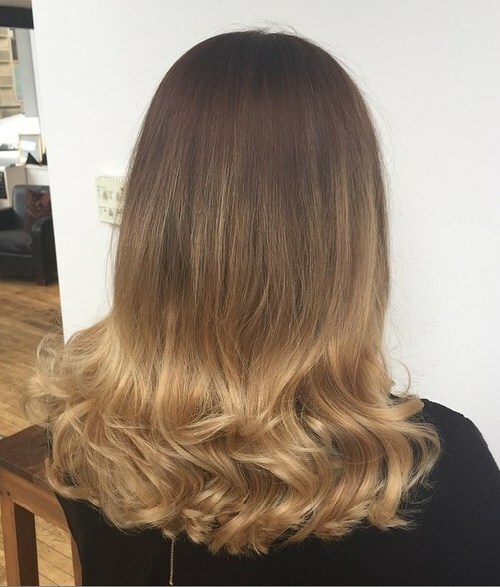 This carefully graduated ombré finishes with a lovely bright shade of golden-blonde, which looks as if the end waves are bathed in sunlight! 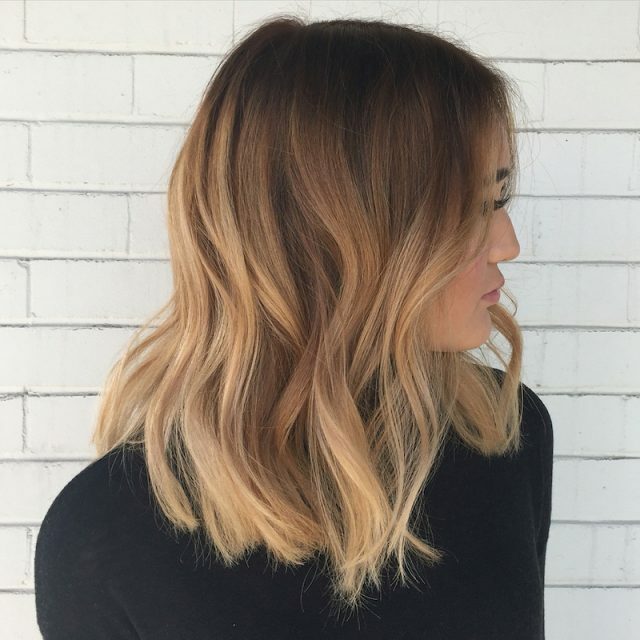 This year almost all fashionable women with brunette hair have opted for some type of blonde ombré and they look really great! 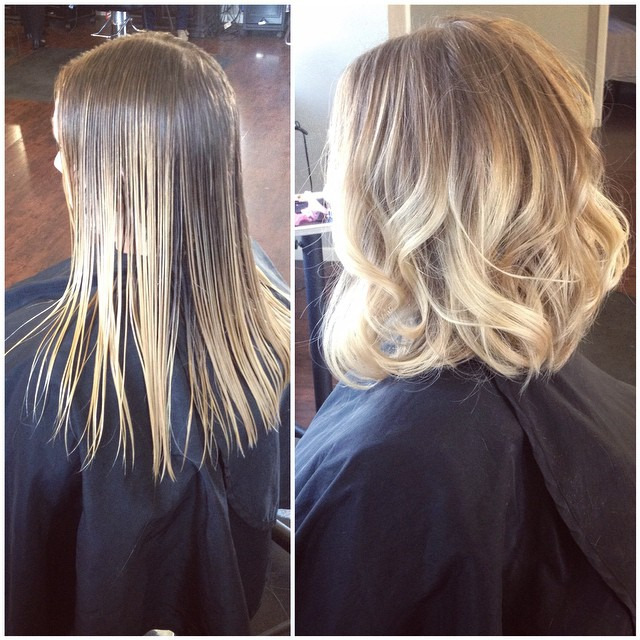 This version uses a subtle balayage technique to add fine vertical blonde highlights from high on the head, leaving the dark base color just on the roots. Straight blonde hair and black leather jacket suggest a ‘biker’ fashion style. 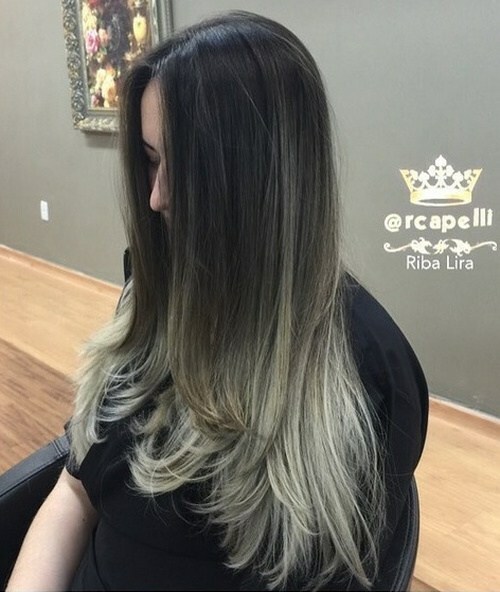 However, this modern interpretation is softer and the long tresses have a blunt, straight edge across the back, instead of pointed ‘rat’s tails’. The color scheme is faithful to the classic ‘blonde biker’ stereotype, but with attractive, modern colors from warm caramel brown to golden and beige-blonde. 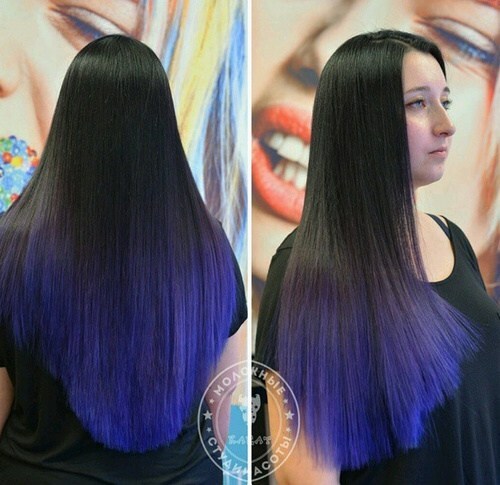 Long black hair offers a fantastic background for some vivid rainbow-color ombré ideas and this indigo-blue color creates an amazing fashion statement on long hair. 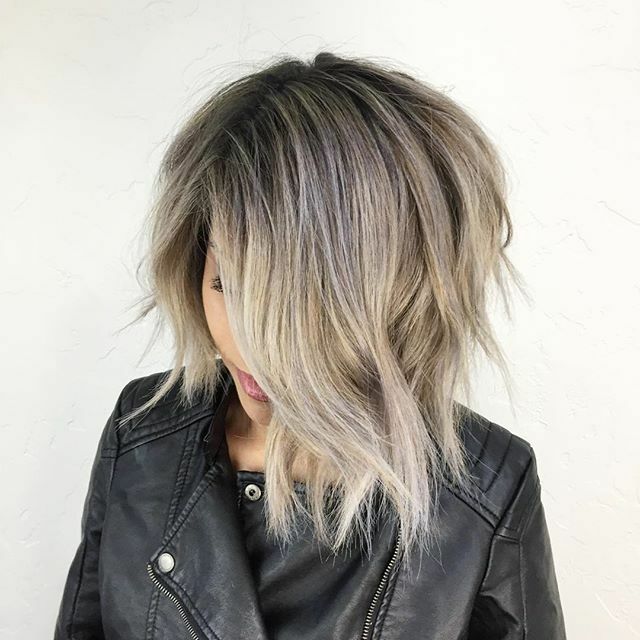 The shape is unusual, too, with curved graduations ending in a U-shaped back, very heavily textured tips and a choppy finish to this impressive look. 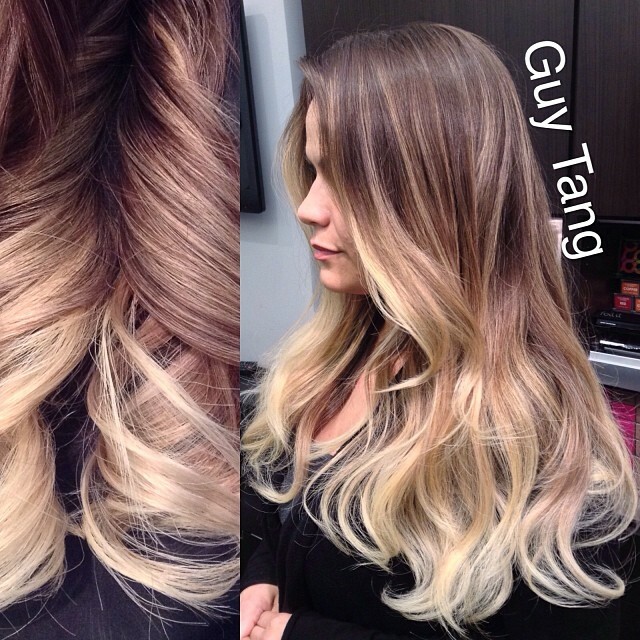 These two images of the same hair show exactly how multi-colored balayage-ombré colors appear in different styles. 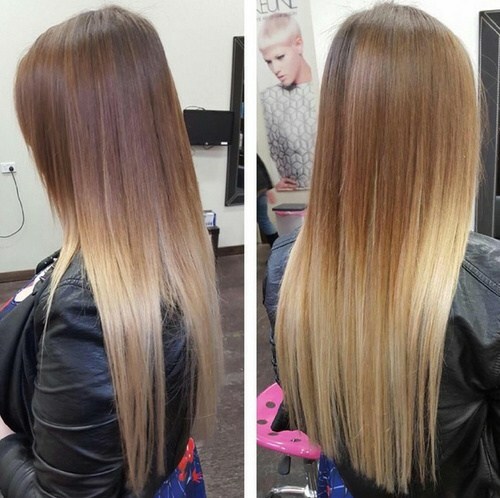 The straight look shows the colors in a two-dimensional flat line. 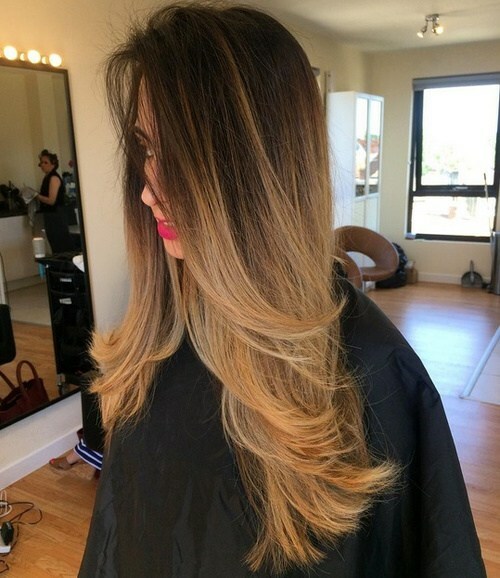 However, when the hair is waved and tousled you get a fancier, 3-D effect with colors overlapping in a texture that reflects loads more light! 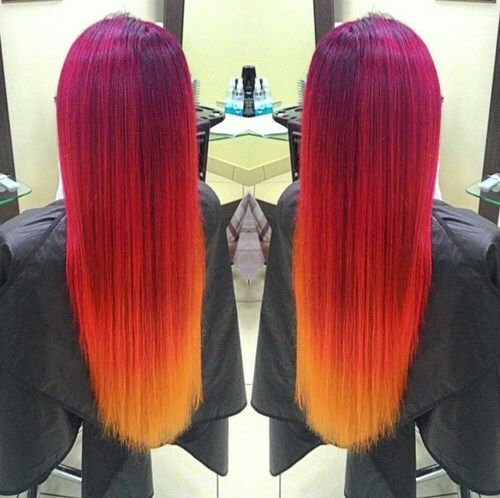 This amazing ombré, based on the natural colors of a tropical sunset, is a hairstyle worthy of a stage appearance from a first-rate pop artiste. 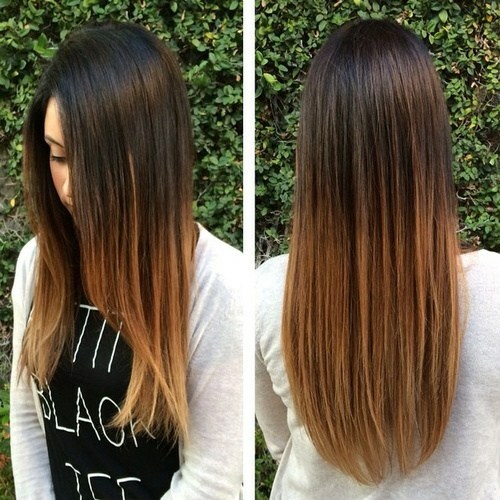 On long, straight hair it makes a powerful fashion statement, but imagine how it looks with waves or in an up-style! 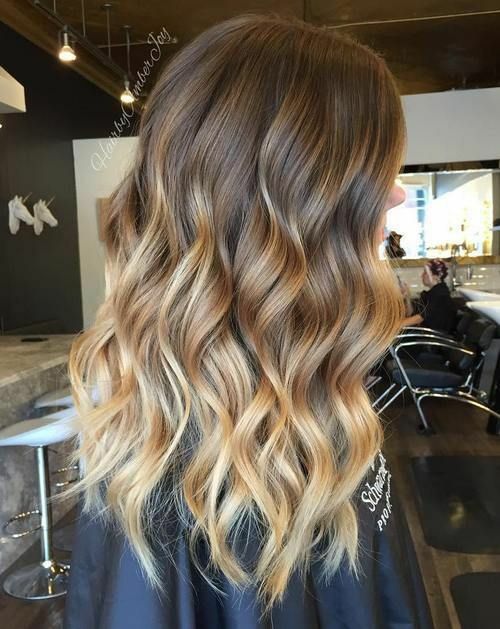 This magnificent dip-dye graduated ombré is another example of the hot hair color trend that’s matching black/coffee brown hair with soft orange balayage and ombré designs. 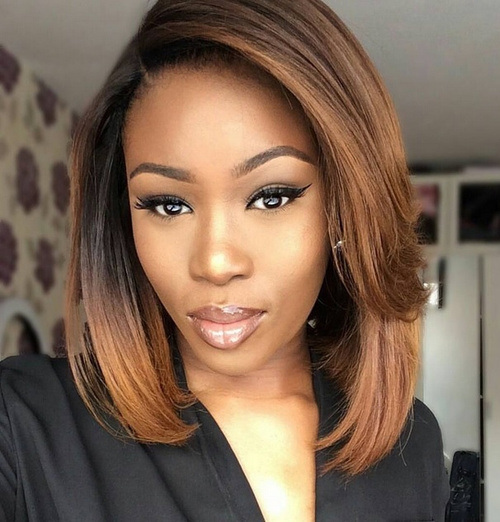 Darker colors, like deep red, flatter darker skin-tones so remember to keep the colors that complement your individual skin-tone next to your face. 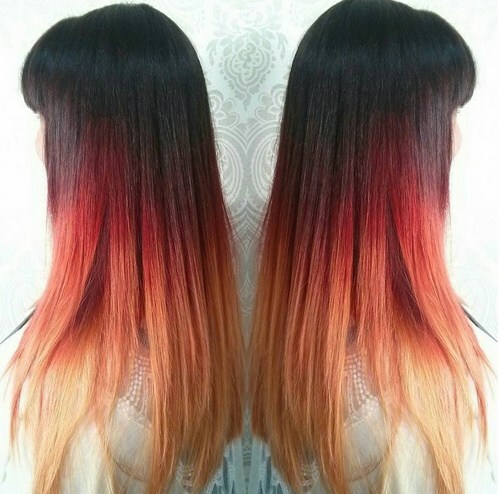 If your work-place is not too keen on extravagant rainbow hair colors, you can still show your fashion flair with a natural color ombré. 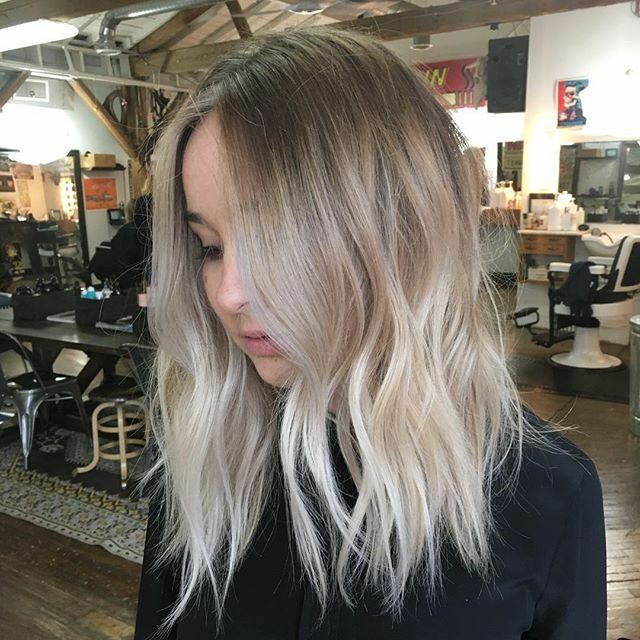 This classic look has long layers which are heavily textured and shaped at the tips to create a soft U-shaped outline at the back. 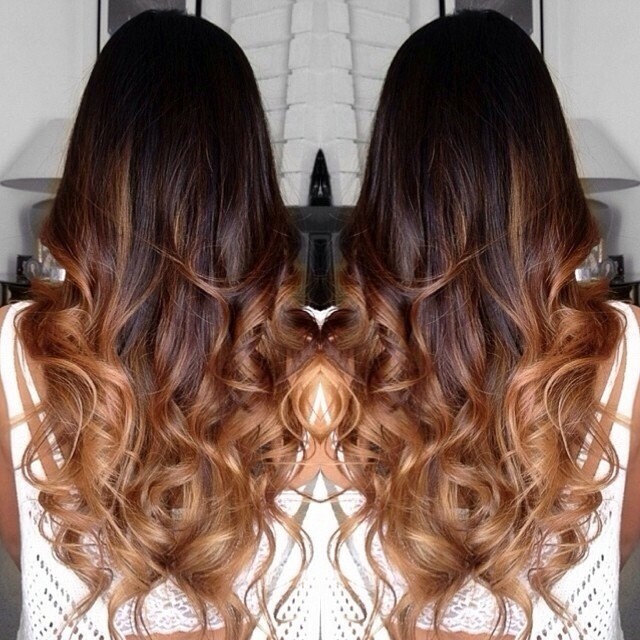 With half of the hair lightened to caramel-blonde your ponytails, braids and up-styles will look fabulously modern! 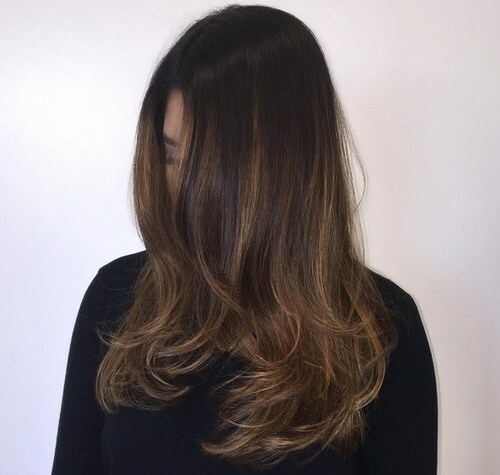 Deep muted red flatters olive and darker skin-tones beautifully, and this haircut with clearly defined layers looks warmer and softer with red balayage-ombré. 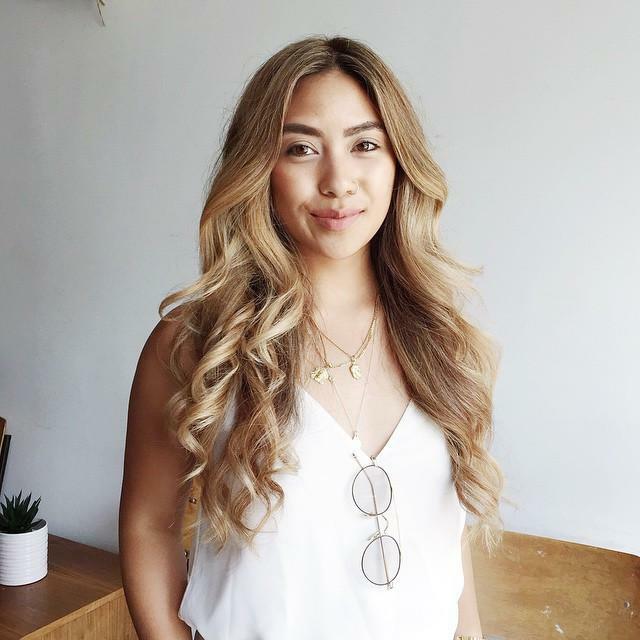 An off-center parting suits faces between oval and round, and heart faces, as the cute wave above the forehead adds flattering height to lengthen the face and volume around the chin adds width to a narrow chin. 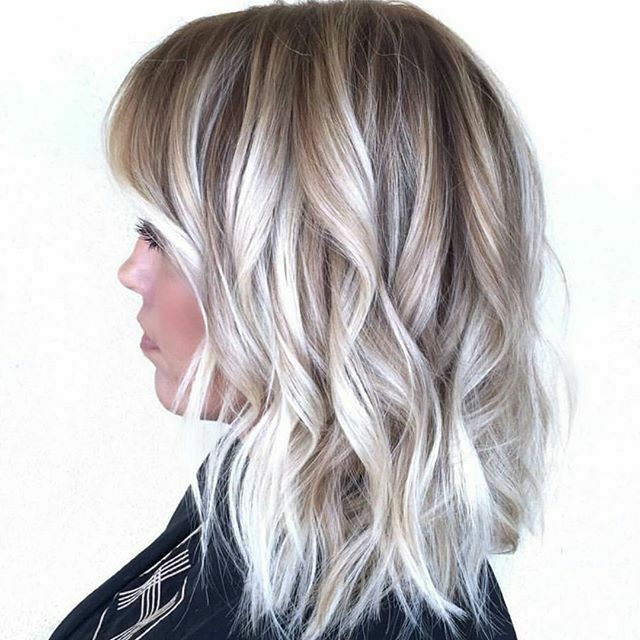 This sharply-tipped long haircut is extremely chic owing to the faded effect from a horizontal band of beige-blonde, set between the medium-blonde top and tips! 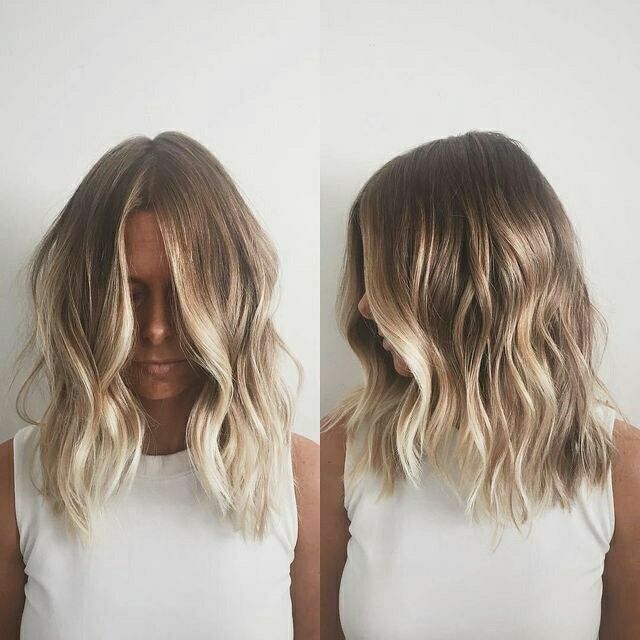 The shorter lengths around the face create a sweeping curve to soften the line, creating a contrast with the textured shaggy tips. 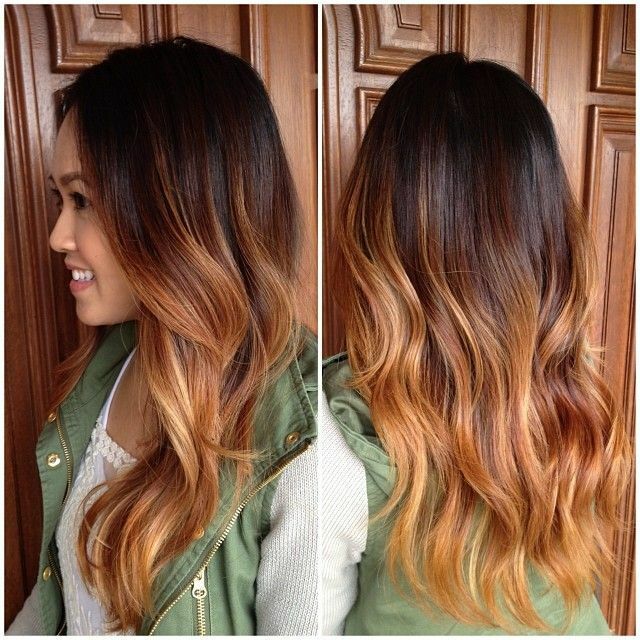 Brunettes with darker skin-tones look fantastic in this trendy new hair color idea, which looks warm and contemporary. 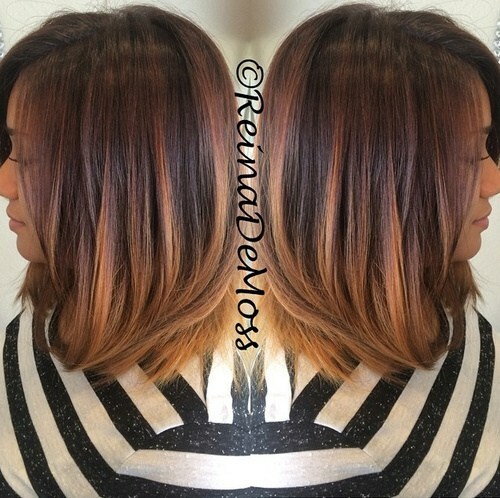 On medium or fine hair, this long A-line bob is brought to life by burnt-orange balayage in the sides, which becomes gorgeous copper ombré at the finely textured, feather tips. 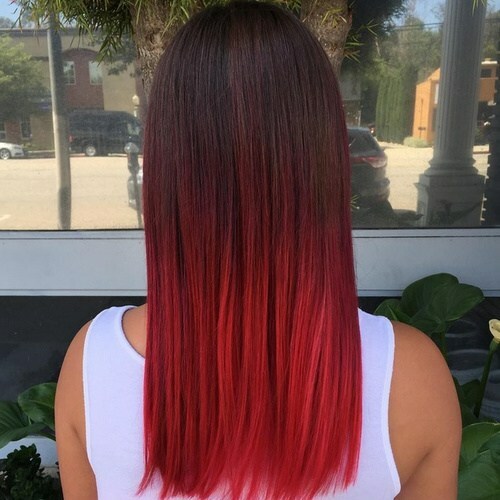 If you’re looking for a fun look for the summer, try this red ombré which complements the model’s olive skin-tone perfectly. 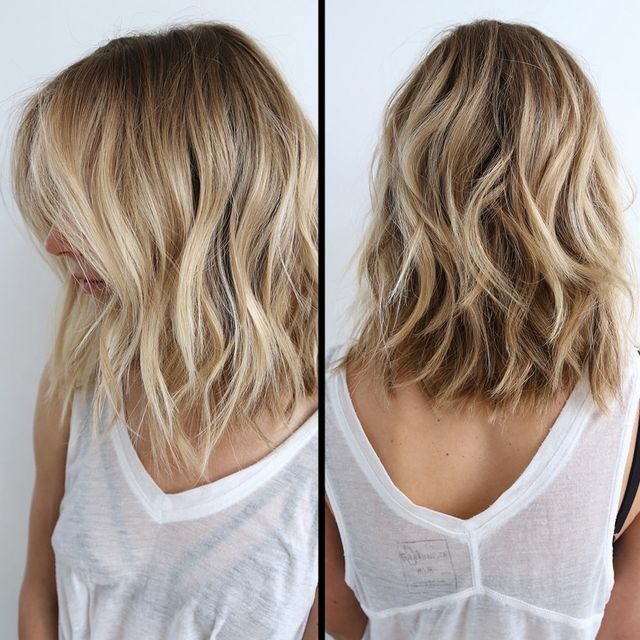 The simple, same-length long cut also has textured tips creating a cute feathered look at the ends and looks fabulous worn in a pony-tail! 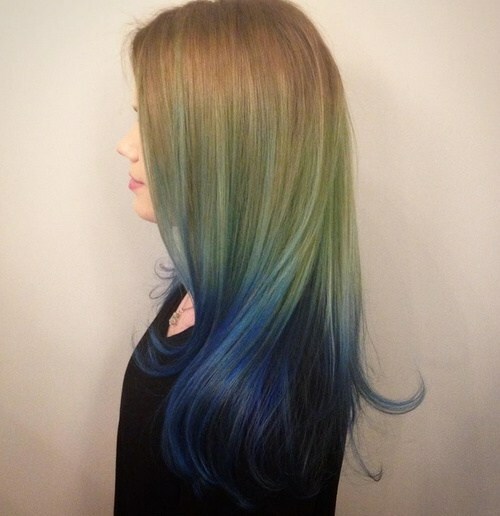 This expertly applied hair color design is a more sophisticated version of last year’s green, mermaid ombré. 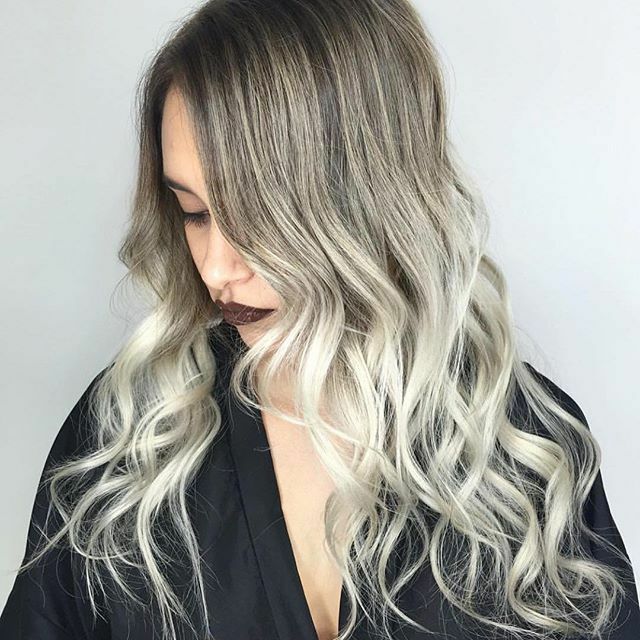 Soft medium-blonde roots become shimmering acid-green before changing to light- and then rich, midnight-blue in lightly waved tips. Shorter layers around the face soften the line and rest lightly at décolletage-level. 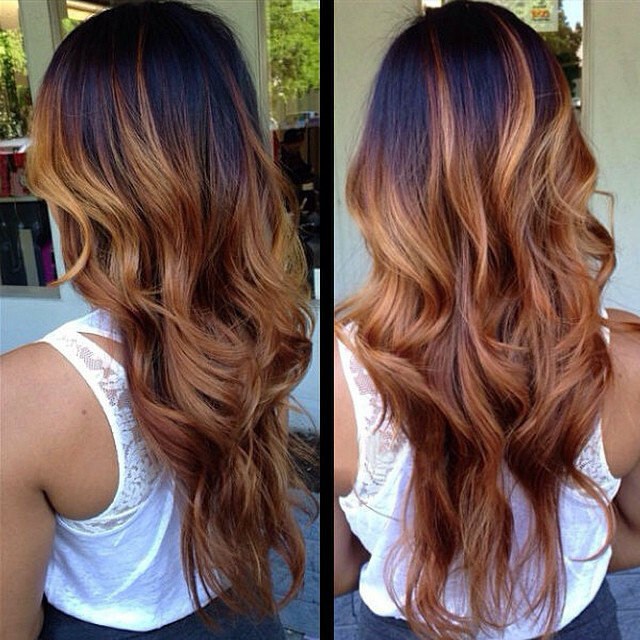 This perfectly harmonized hair color idea shows how warm copper-orange can highlight deep-brown eyes and a lovely skin-tone. The side-parting creates a flattering wave bordering the rounded forehead and sweeping down to end in line with the lips. 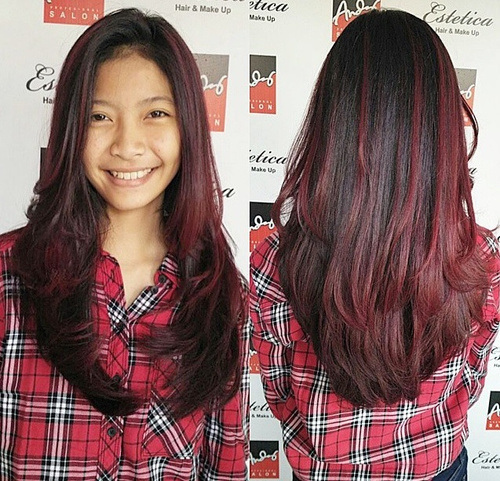 Along with natural make-up, this simple style creates a sophisticated image. 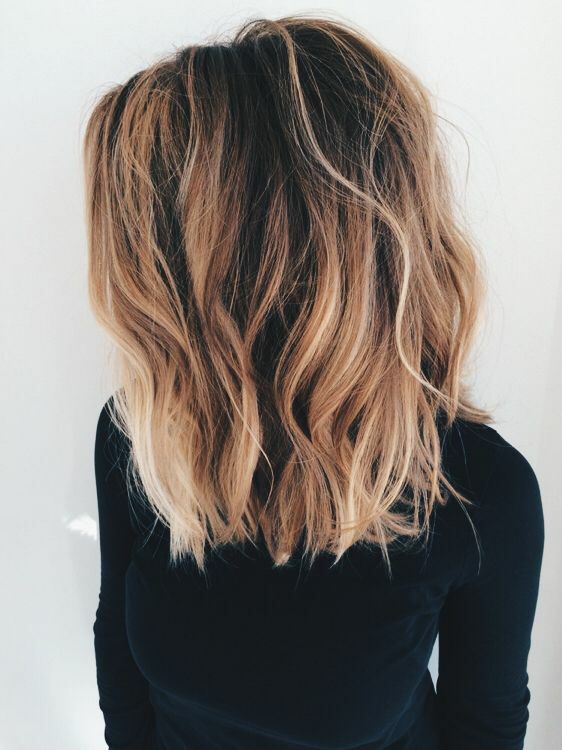 This layered cut has been bleached to create a medium-blonde ombré – but are the shaggy-looking tips ‘trendy’ or the result of chemical damage? 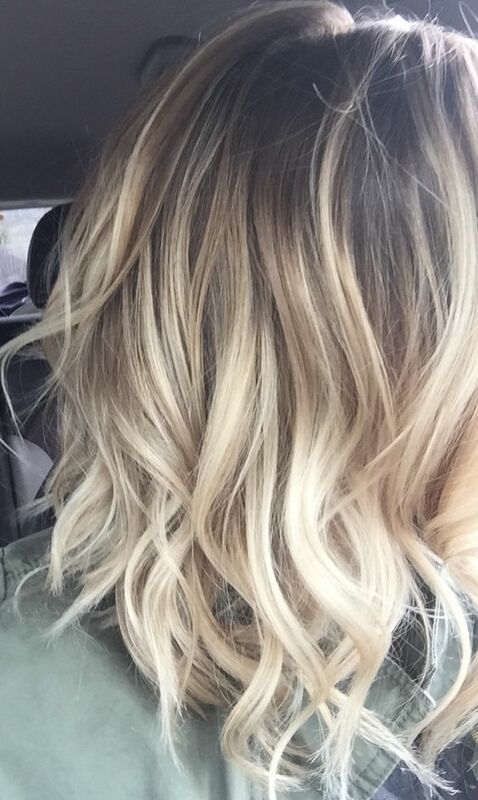 It looks as if this model’s hair has been over-bleached and this is what brittle, over-processed hair looks like, I’m afraid. 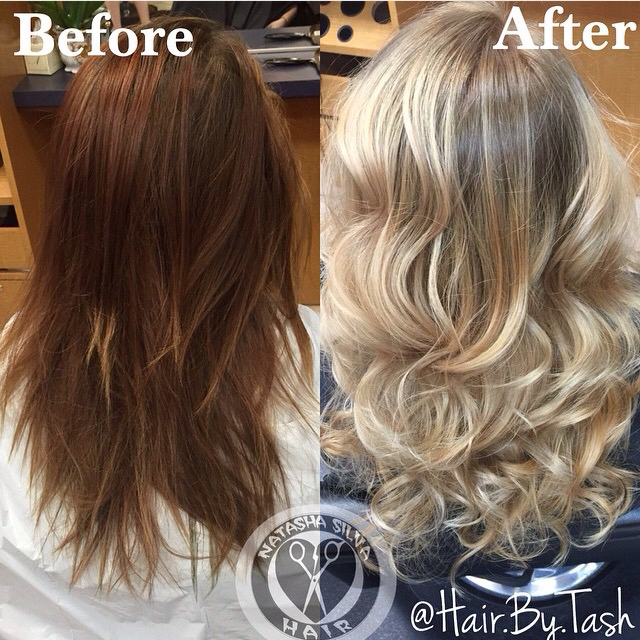 Just a reminder to use an expert colorist for lightening processes! 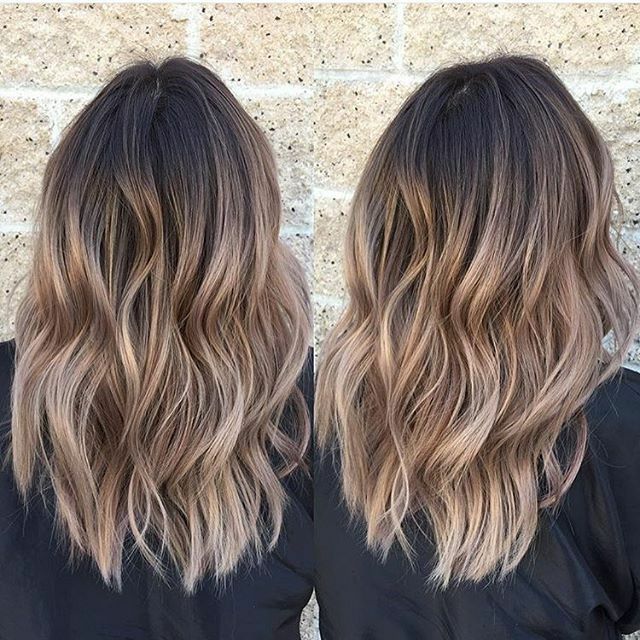 This high-fashion hair color is a very trendy blend (and contrast) of soft, beige-blondes with copper and dark-chocolate brown. 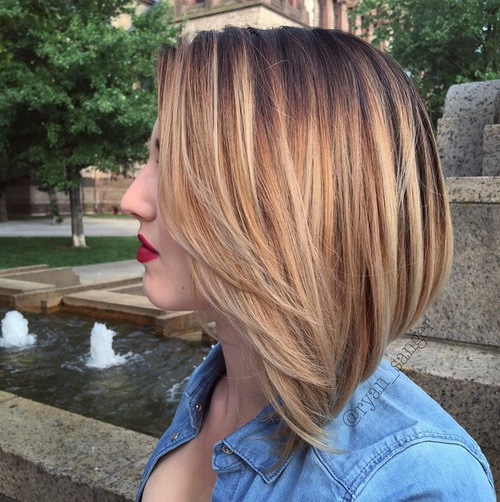 Long angled bobs on medium/fine hair need a little something extra to add texture and movement and this creative cut-and-color is a very chic hair design. 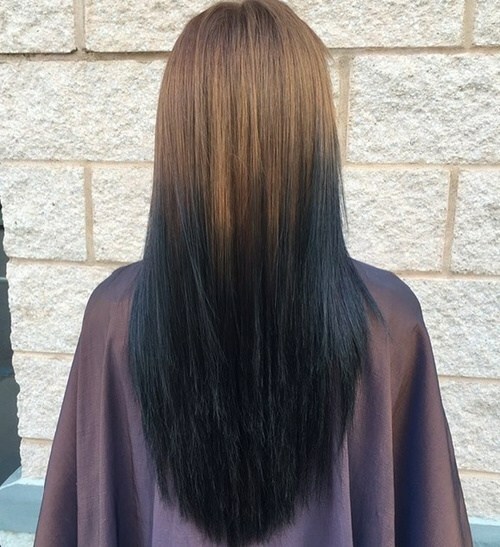 Here’s an edgy look that adds lots of gothic drama to light-brown hair. 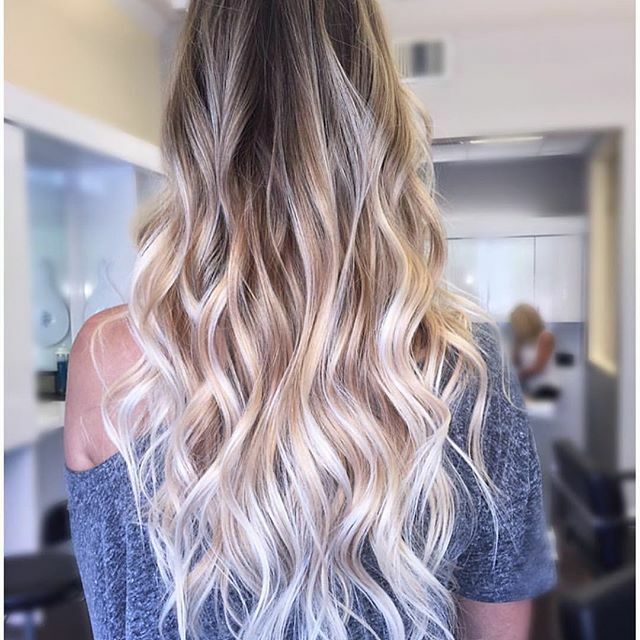 The layers are highly textured for a shaggy texture on the U-shaped line at the back and this unusual color combo will make a fabulous ponytail, braid or up-style! 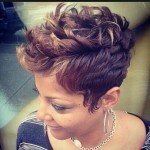 Here’s a simple style with edgy textured tips creating a wispy look at the ends. 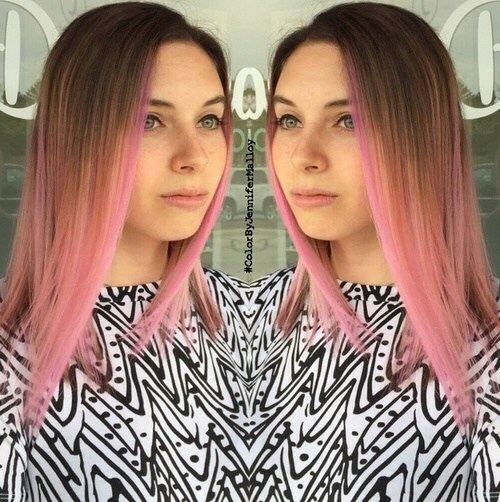 This simplicity balances well with a fancy balayage and ombré design mixing blonde with candy-floss pink, face-framing tresses. 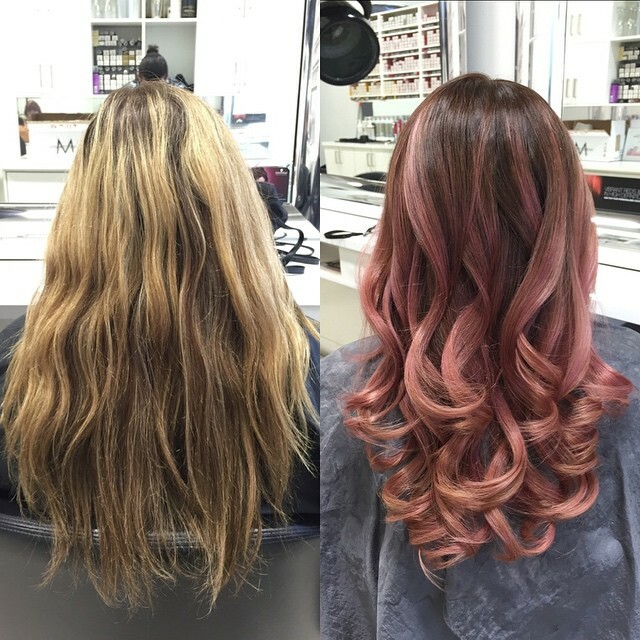 I love the creative contrast between soft pink and those asymmetrical straight lines with brown tips! This cool, muted-green shade actually matches the color of the walls behind the model! 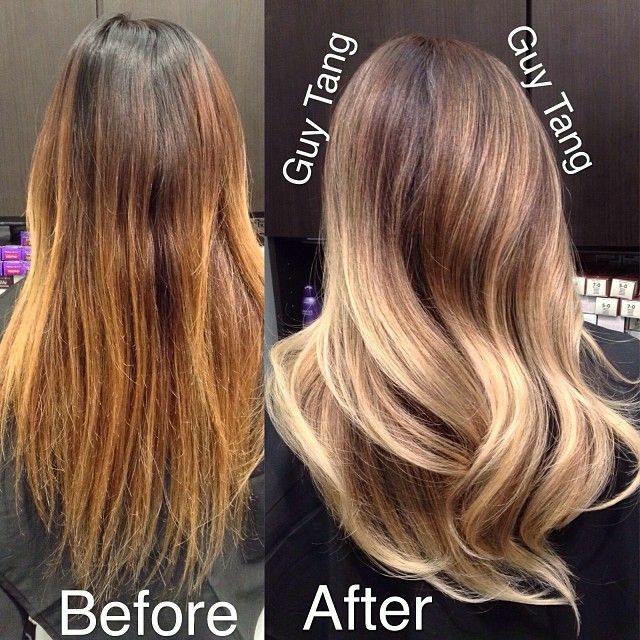 But what it’s really saying is that you can now have your hair tinted to whatever shade you fancy. 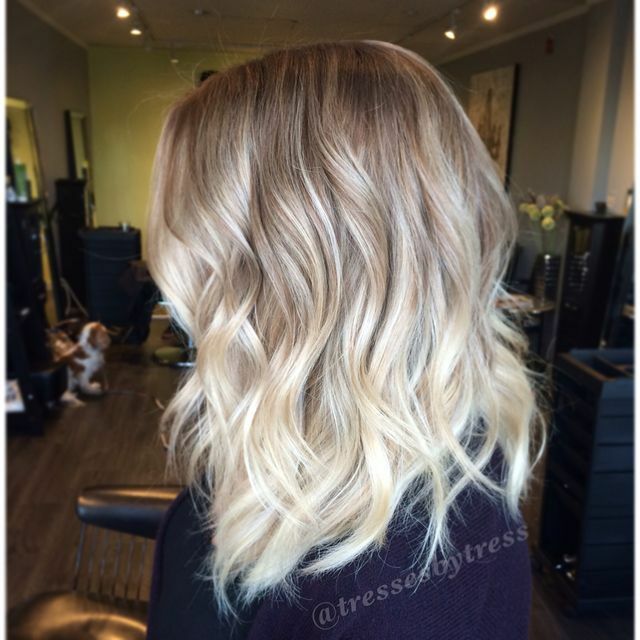 This is actually a neutral-blonde ombré, temporarily tinted with green gloss ‘wash-in, wash-out’ color to demonstrate what can be done! 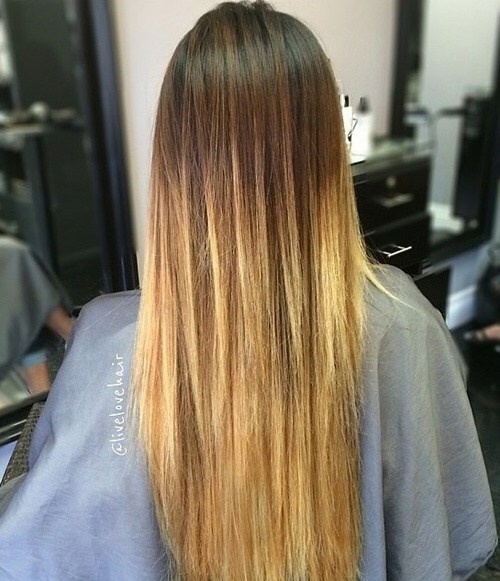 And from drab-green let’s finish with this sunny golden ombré on long hair that shows how cheerful some colors are! It’s an important point – because now the range of colors is virtually infinite, you need to make sure you choose a color that creates a positive image and enhances your individual skin-tone and eye-color! 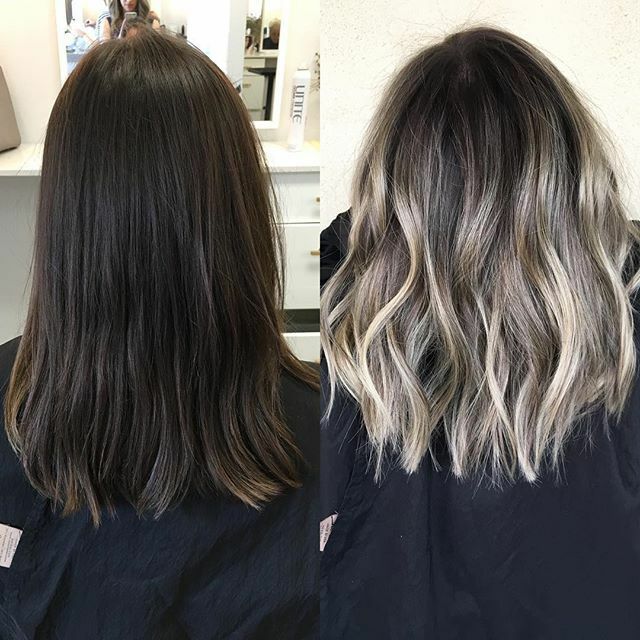 With a neutral-blonde ombré and temporary hair colors like Crazy Color or Revlon Tinted Gloss, you can change the shades in your hair to match your outfit! So which new colors will you be wearing?